Everyone has someone in their family that is the go-to person for cooking a specific dish. In my family, I am not that person for ribs. 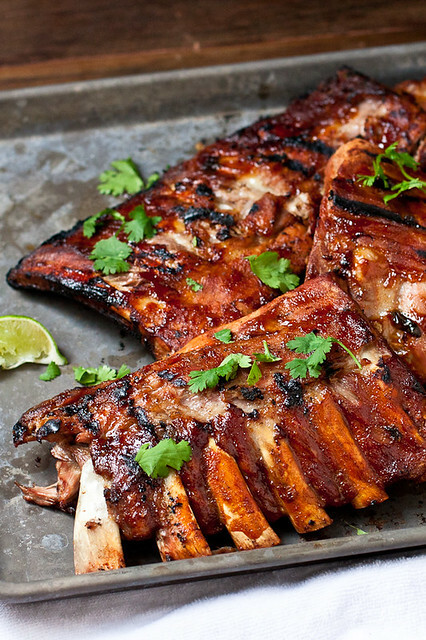 At a cookout in 2011, with a Fine Cooking magazine in one hand and a margarita in the other (possibly my problem), I slapped my very first rack of ribs on the grill while a hungry group of people salivated. 30 minutes later, I was in the kitchen trying to pick off scorched foil from scorched meat – or maybe it was bone… it was all black, hard, and crusty and there was very little distinguishing the two. And Jason was outside trying to prevent the garage from catching fire. It wasn’t a total loss. Just maybe half the ribs. And 7/8 of my pride. This year, with my trusty ol’ Fine Cooking magazine in one hand (I still had it and just dropped it into the recycling bin today) and a margarita in the other (clearly not the problem! ), I slapped my I-have-lost-count rack of ribs on the grill while (fewer) hungry people salivated. And then 2 hours later, I texted my little brother: My streak of not burning the ribs and my house down is at 3 years! These are, hands down, my very favorite ribs that my little brother doesn’t make. And only partly because the recipe uses 4 shots of tequila. Baby back ribs are marinated overnight in a tequila-citrus-chile powder marinade that’s reduced with – wait for it – more tequila and citrus. 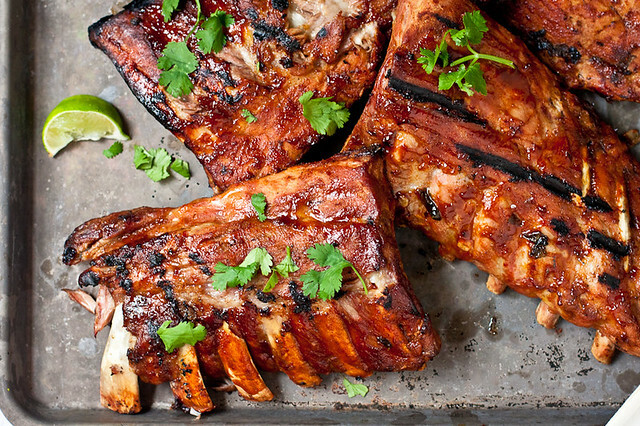 The grilled, fall-off-the-bone-tender ribs are finished with the “margarita glaze” before they are inhaled by your family and everyone is left staring at you wondering why you didn’t make more. 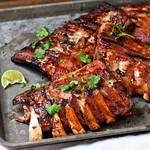 Tender baby back ribs are marinated and glazed with tequila and citrus. Cut each rack of ribs in half and place 2 sections each in a gallon zipper bag. In a medium bowl, whisk together the marinade ingredients and pour half into each bag. Seal the bags, turn to coat, and place in a baking dish in the fridge. Let marinate overnight, turning a couple of times. Transfer the marinade to a pot and add the glaze ingredients. Bring to a boil and then reduce heat to a simmer. Reduce glaze to a thick sauce. Heat grill to 250-300 degrees. Wrap each rib section in a foil pouch and cook (indirect heat recommended but my grill isn't big enough to accommodate two racks over indirect heat). Cook for ~90 minutes and tear into one of the pouches to see if the meat is tender and is pulling from the bone. Carefully open the foil pouches and glaze the ribs, leaving the foil peeled back so the sauce will caramelize. Cook for 5 minutes and then glaze again. Repeat and then transfer to a foil-tented platter to rest for 10 minutes. 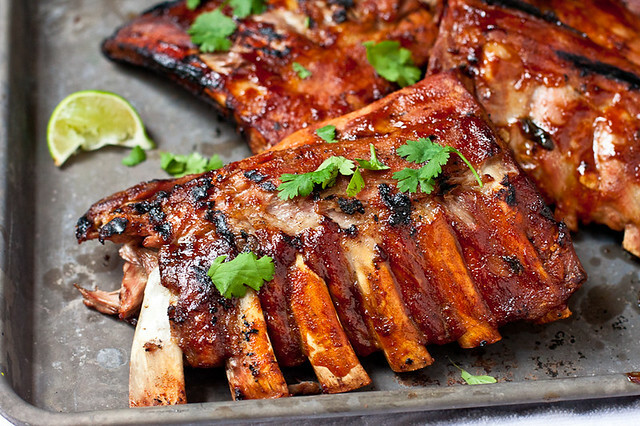 Cut ribs and serve any remaining glaze on the side as a sauce. Well you nailed it this time, these ribs look and sound incredible. Nice job! I would like to sink my teeth in these gorgeous looking ribs.. 😀 marinade sounds just fantastic! You sure do know how to grab a girls attention on a Monday morning! Those look amazing.